Norman provides extensive expertise & inventory in a complete range air regulators from Fairchild to meet all of your service needs. Fairchild's wide selection satisfies your instrument or industrial control applications. 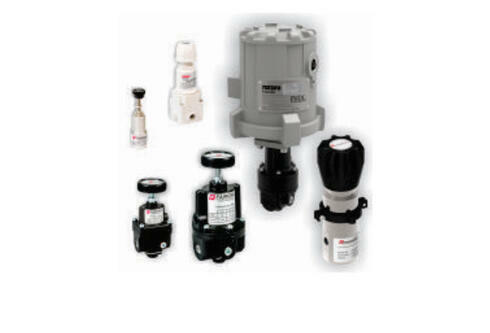 Fairchild pneumatic regulators are available as: precision, back pressure, miniature, filter service, stainless steel, motorized, low pressure, and specialty. 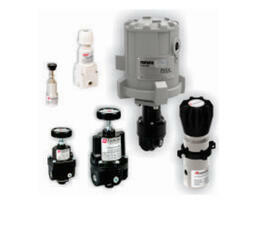 Back Pressure Regulators – Require high precision control of back pressure or relief pressures. The Fairchild Models 10BP and 30BP offer high precision. 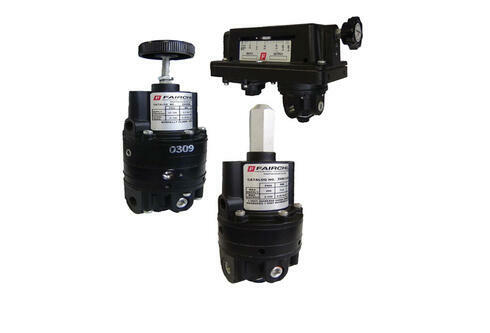 Models 50BP Polymer, 66BP Stainless Steel and 4000ABP High Flow back pressure regulators are designed for tough applications. 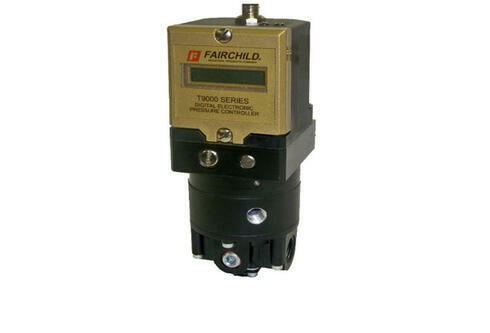 Miniature Pressure Regulators - Fairchild Model 70 offers high precision in a tiny package. Model 72 High Performance Miniature regulator features an improved design for even better performance, while the Model 50 Polymer regulator excels in lightweight, medical, and tough applications. 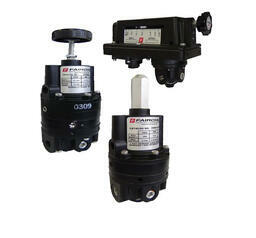 For more information, please visit our Pressure Regulators page here. 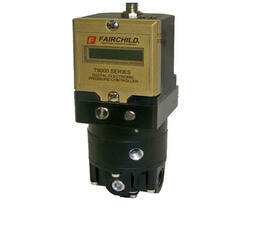 We specialize in fast response, high flow, & high accuracy transducers developed by Fairchild Industrial Products. Fairchild's fast response, high flow, compact electro-pneumatic transducers have extensive combinations of inputs and outputs, carry standard FM, CSA, ATEX, or IECEx agency approvals, and maintain accuracies of 0.25% or 0.5%. Industrial Process Transducers - The Process Control line of Industrial Process transducers from Fairchild utilizes a flapper and nozzle attached to a voice coil to proportionally regulate the output pressure. The Fairchild T5200, T5400, T5700 and T6000 pressure transducer series offer dependable performance at economical prices. The T6100 Industrial Process unit also offers "Lock in Last Place" reliability and easy to use product configuration. High Accuracy Electro-Pneumatic Transducers - a complete range of high performance transducers for every application: includes the compact Electro-Pneumatic and Industrial Process T7800 series with piezoelectric actuator and the T9000 Electro-Pneumatic Pressure Controller with a closed-loop integrated, microprocessor control system. Explosion Proof Transducers - For applications with natural gas media and others which require reliable and accurate explosion proof transducers which carry all FM, CSA, ATEX and IECEx agency approvals for years of worry free operation. 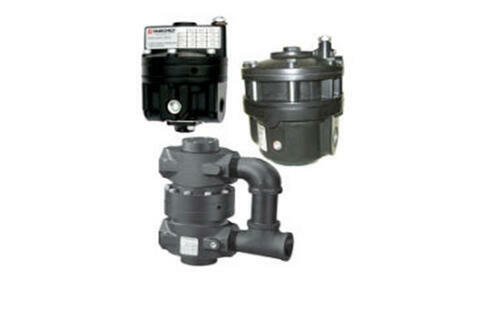 Additionally, the TX18750 incorporates patented technology to provide a moisture resistant Industrial Process unit. Fairchild volume boosters feature high flow capacity with a wide range of signal to output pressure rations, pilot operated, various pipe sizes, & accessories to meet your unique needs. Volume boosters by Fairchild are most commonly used to supply a higher but precise pressure to a particular line or control device. They take an unregulated supply line pressure and convert it to a well-regulated, highly controlled pressure as required by the operation. 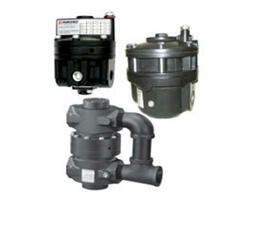 Volume boosters also are used as part of an interface between pneumatic and electric circuits. Fairchild’s line of pneumatic relays serve all control applications such as positive biasing, infinitely adjustable ration, reversing, computing relays, & many more. For over 50 years, Fairchild Industrial Products Company, a division of Rotork, has maintained an excellent reputation as a manufacturer of precision, high quality, pneumatic and electro-pneumatic controls.